Discoveries have been made in Argentina, Colombia, Guyana, Paraguay and Peru, and all of these projects are likely to come on stream in the next five to 10 years. There are a number of reasons for the excitement, Richard Spencer, president and CEO of Canadian uranium exploration company U3O8 Corp (TSX: UWE) told MINING.com. First, South America hasn’t historically produced much uranium, which means investors haven’t paid much attention to the market, he said. But the recent deposit findings are making investors realize the share prices of this handful of companies should appreciate strongly as these deposits are proved up, he adds. 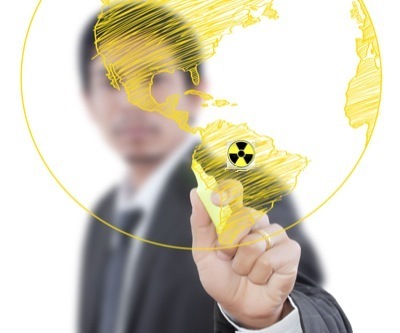 Another reason for the increasing enthusiasm around uranium mining in South American countries is the favourable economic and regulatory environment they provide, according to Spencer. Latin American economies are experiencing rapid growth. Colombia, for instance, is growing at an average annual rate of 5%. The country, where U3O8 Corp has its flagship Berlin project, is now the second-largest economy in the region after Brazil. “Yet there exists considerable growth prospects in their mining sector, which only accounts for 2.4% of Colombia’s GDP,” U3O8 Corp’s CEO explains. Nuclear power is currently used in Argentina, Mexico and Brazil. This country is the only uranium producer in South America and it consumes all of its uranium output, while Argentina is advancing its state-owned Cerro Solo deposit towards production. For now, it imports all of its supply from Canada. The largest uranium deposit in South America is Brazil’s Lagoa Real, from which the State produces sufficient yellow element to feed its two nuclear reactors. U3O8 Corp. expects its Berlin deposit to become the second biggest uranium deposit in the Southern continent. The Canadian company plans to export the uranium extracted from its Colombian mine to North American and European processing facilities, where the commodity will be upgraded to fuel for nuclear reactors. Key to the Berlin deposit is the fact it contains an abundance of other valuable commodities such as phosphate, vanadium, rare earths and nickel, among other metals. Phosphate for fertilizer is likely to be sold into the local market, since the project lies adjacent to one of the biggest and richest agricultural areas in Colombia. Berlin’s vanadium output may find its way to Asian markets and the company plans to sell its nickel output to the local Colombian stainless steel industry. Rare earths would be shipped to processing facilities in North America and Asia. “Colombia’s strategic location at the point where North and South America join with ports on both the Pacific Ocean and access to the Atlantic through the Caribbean Sea, provides a further advantage in shipping the various commodities from our Berlin project to different markets,” says Spencer. Because of its considerable size, U3O8 Corp expects Berlin to take slightly longer to start production than the company’s Argentine and Peruvian projects. “The uranium deposits that are likely to become producing mines first are U3O8 Corp’s Laguna Salada deposit in Argentina and Macusani Yellowcake’s deposit in Peru because both are simple to mine and have relatively low capital costs,” explains Spencer. U3O8 Corp’s latest drill results for the Berlin deposit show the company could double the current resource to 45-50 million pounds of uranium along just 6.3 km of strike, growing Berlin to a potential 60 to 80 million pound along the entire 10.5km Berlin trend. The company has preliminary economic assessment underway on the initial deposit defined at Berlin, which is due by end of 2012.